Sangeeta leads the New York Power Authority’s Clean Energy Business which is developing and financing distributed energy resource projects across New York State. Her responsibilities include managing the team’s profit and loss, signing over $300M in construction contracts per year, and reducing greenhouse gas emissions for NYPA’s governmental customers 40% by 2030. 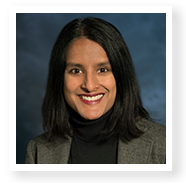 Sangeeta currently serves as a Board Member to the New York State Smart Grid Consortium and the Advanced Energy Research & Technology Center. She is also a member of the Building Energy Exchange’s Industry Leadership Council. She holds an MBA and MS in Environmental Management from the Ross School of Business at the University of Michigan and a BS in environmental engineering from Northwestern University.